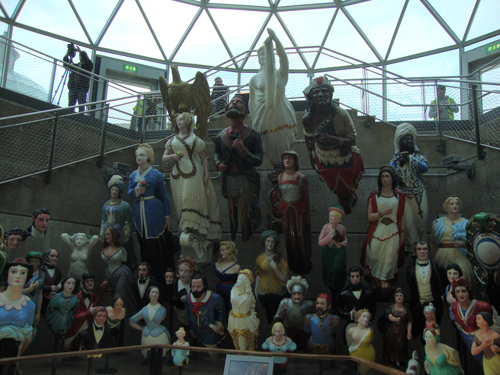 A guest post by London Historians member, Peter Twist. Were Her Majesty the Queen to look upwards when she arrives at the magnificent Sovereign’s gate of the Palace of Westminster for the formal opening of the Houses of Parliament, she would meet the eyes of a lone soldier perched high above her. His duty is to report the moment that the monarch steps into the Palace so that the Union Jack Flag flying from the sky-scraping flagpole of the Victoria Tower directly above could be replaced by the Royal Standard. 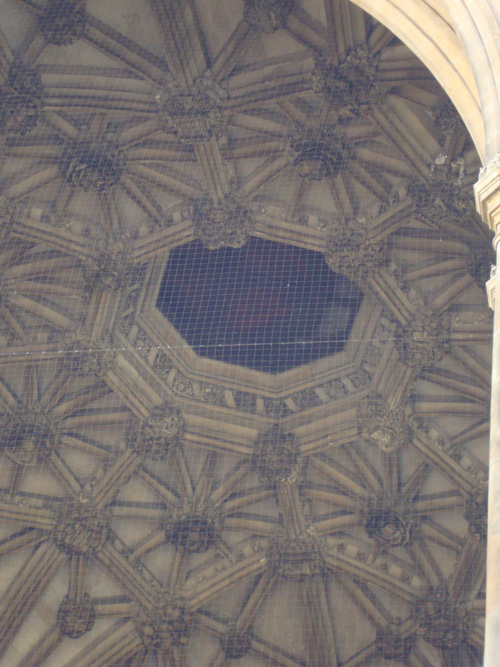 He would be looking down upon Her Majesty through an octagonal viewing hole in the roof, a metal trapdoor having been earlier slid open to afford him a dizzying view of this spectacle. Here’s a video clip. 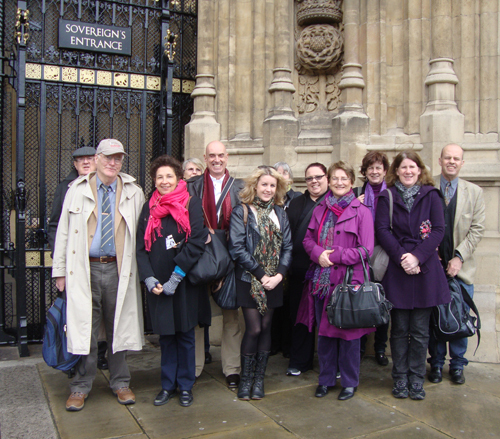 It is no exaggeration to say that the twelve intrepid members of the London Historians who visited the Parliamentary Archives of the Houses of Parliament on Thursday 26th April 2012 were also treated like royalty. We were there as guests of fellow London Historian member Caroline Shenton, the Clerk of the Records at the Parliamentary Archives, which are housed in the Victoria Tower. The Tower was completed in 1860 by Charles Barry to house the historic records of Parliament. It continues to serve this purpose today, storing approximately 3 million records of the House of Lords and House of Commons on parchment, paper and film, all of which are available to the public at no charge online or in person, by appointment, in the dedicated search room. 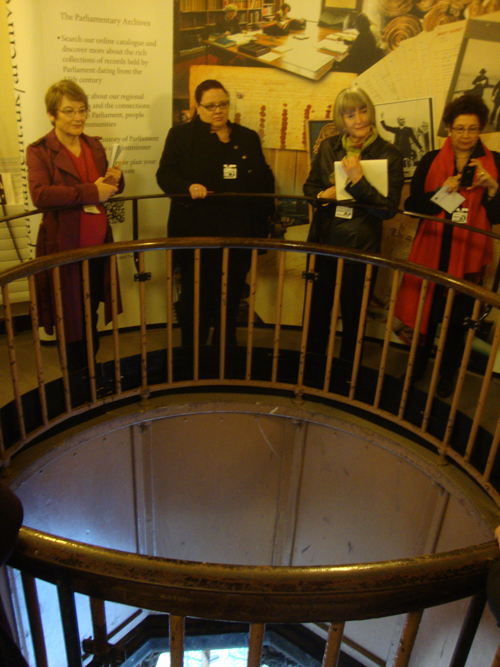 After rigorous security checks, including having to substitute our pens for special pencils, Caroline escorted us upwards in a succession of ever smaller lifts. 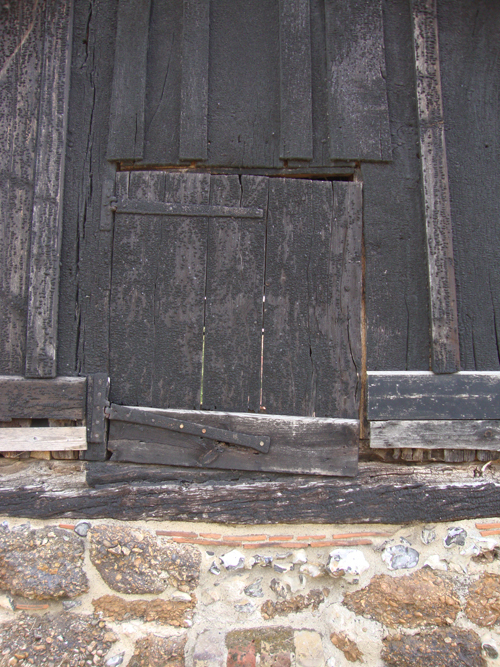 She exercised great strength by turning a large capstan handle which opened the metal trapdoor in the roof of the Sovereign’s Entrance. Fortunately we were excused the necessity of climbing the 553 steps. Pride of place in our visit was our admission into one of eight strong rooms which house the archives in a carefully climate controlled environment. 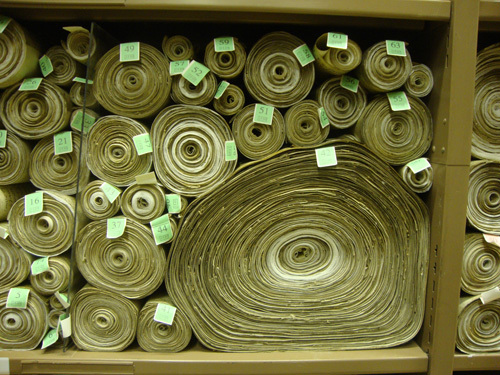 All around us were thousands upon thousands of carefully rolled parchment scrolls, representing every Act of Parliament passed, the longest of which is a Land Tax Act passed in 1821, made up of 757 membranes and estimated to be a quarter of a mile long unrolled. 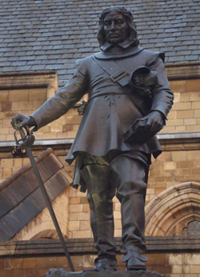 Of particular interest to London Historians are all the Local and Personal Acts of Parliament passed, including many diverse Private Acts, such as one enabling Handel’s naturalisation. It is truly an unappreciated cornucopia of material for all aspects of historical research, including family history, social, constitutional and political history, town planning and railway and road building. They are complemented by remarkable collections of personal political papers, including the papers of Lord Beaverbrook, Andrew Bonar Law and David Lloyd George. For our special interest, Caroline had laid out a small selection of treasure from the Archive. These included the Royal Commission for the prorogation of Parliament, 12 October 1573, signed by Elizabeth I, and a Suffragette banner unfurled from the Ladies Gallery in the House of Commons on 28 October 1908. These are beautifully described and illustrated in the Houses of Parliament publication, ‘Victoria Tower Treasures from the Parliamentary Archives‘, published in 2010, which Caroline has jointly written with two colleagues, available from the Archive at £12.99. Henry VII's autograph from 1498, one of the oldest documents in the archive. 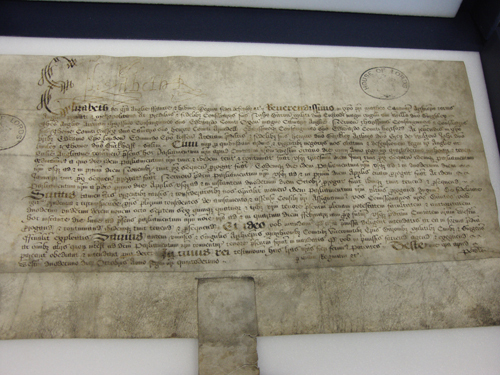 His grand-daughter - Elizabeth I - signed this proroguation document. Drawing showing proposed east end of the new embankment by Joseph Bazalgette from 1862-3. Sadly on the night of 16 October 1834 a devastating fire broke out in the Palace and most of the records of the House of Commons were lost. The gripping story of the fire over the course of that fateful day and night is the subject of a new book by Caroline Shenton, ‘The Day Parliament Burned Down‘, due to be published by Oxford University Press on 9 August 2012. 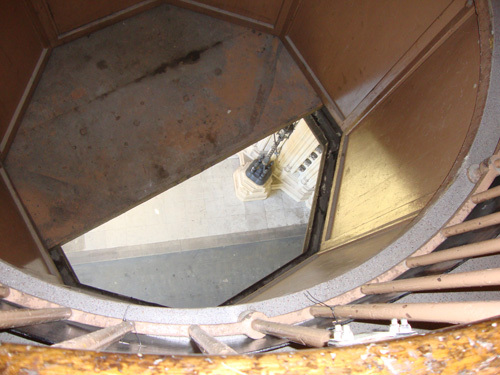 Records held in the Victoria Tower are described in the online catalogue Portcullis at www.portcullis.parliament.uk. More information about the work of the Parliamentary Archives can be found at www.parliament.uk/archives. 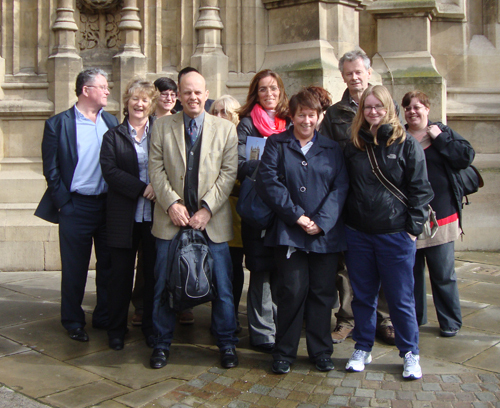 We were extremely grateful to Mike for arranging this visit and to Caroline for making it possible. Peter is presently a Student City of London Guide, hoping to qualify in June 2012. *Further photos on Flickr by LH member Andrea Vail, here. 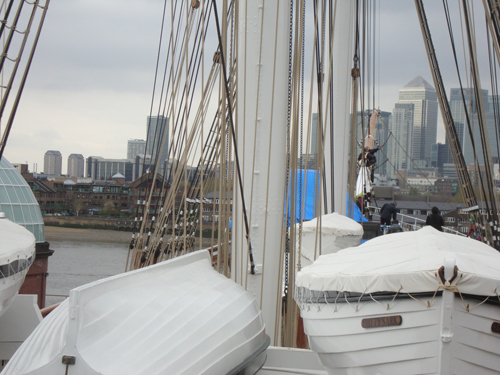 Tomorrow Her Majesty will do the honours at the Cutty Sark in Greenwich after a six year, £50 million restoration, cruelly interrupted by a fire which almost destroyed the iconic clipper. 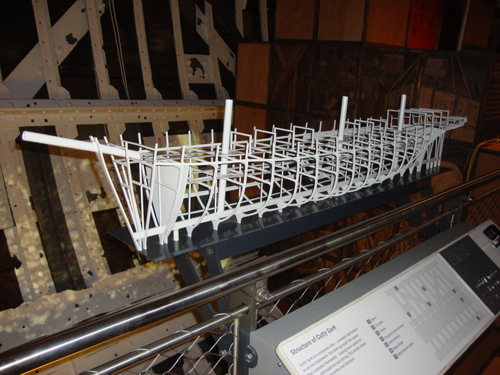 The whole project has been mired in controversy, mainly to do with the decision to lift the vessel about eight feet above the ground rather than allowing her keel to rest upon it; and also the doughnut-shaped glass surround which quite seriously obscures the bottom section of the hull, it must be said. These and other criticisms were summarised in a vitriolic piece by the journalist Andrew Gilligan last weekend. While he raised some good points, the whole piece was rather bitter and ranty, rather spoiling whatever case he was trying to make. So was he right? I can see his point about the “doughnut”. But I think it’s a bold idea, well executed. It will be a Marmite issue, I think. How about the lifting of the hull? 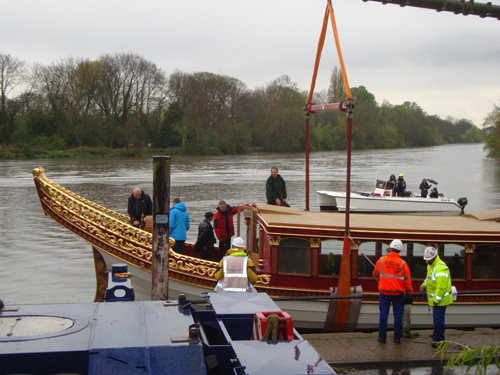 The argument is that it undermines the integrity and possibly even irreparably damages the vessel. Again it is a bold move, but in my opinion wholly successful. Let’s face it, the ship isn’t going to sail anywhere ever again. 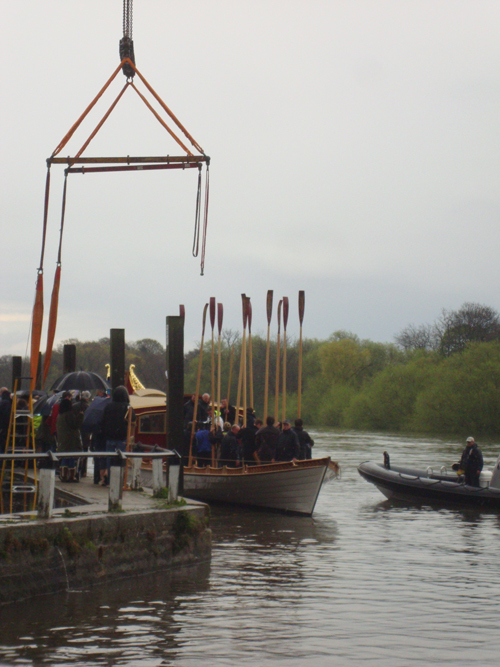 Is it likely that leading structural engineers would design a rig that was likely to break the boat? Unlikely. Time will tell, of course, but I reckon we’re okay. Once aboard, everywhere you look, the boat is gorgeous. 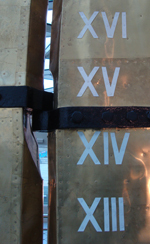 The conservators have done a great job but more importantly the curators have excelled at the way they have used tea-chest and wool sack motifs, designs and lettering to tell the clipper’s story. This is how 21st Century museum display and curating is done. Sometimes it doesn’t work, often it does. Certain people of the anorak tendency might not like it. But I believe the public at large, including historians, and certainly including me – will love it. 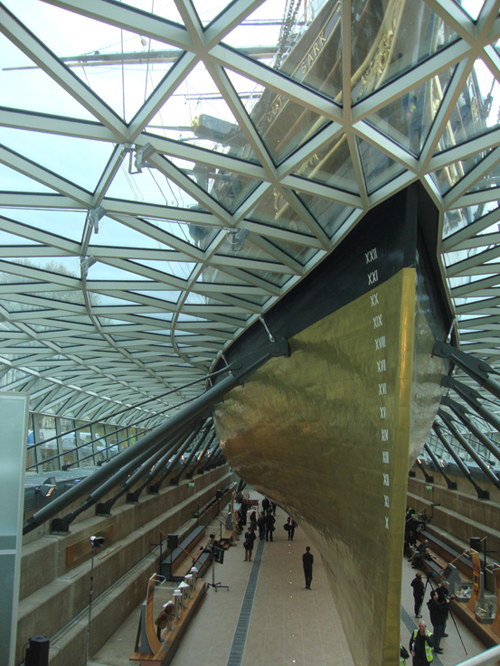 Cutty Sark was built in 1869. 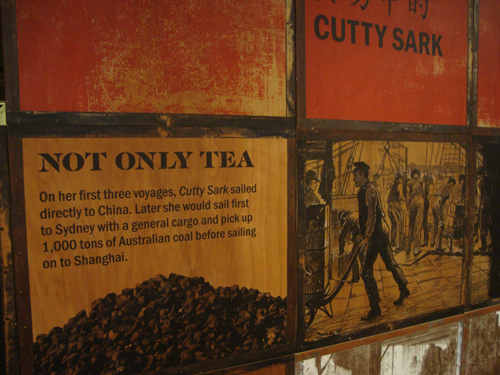 Her heyday lasted only about 25 years, first shipping tea from China and then wool from Sydney. She then spent the same amount of time again as a re-named Portuguese transporter between Europe, Africa and the Americas. She was brought to Greenwich in 1952. 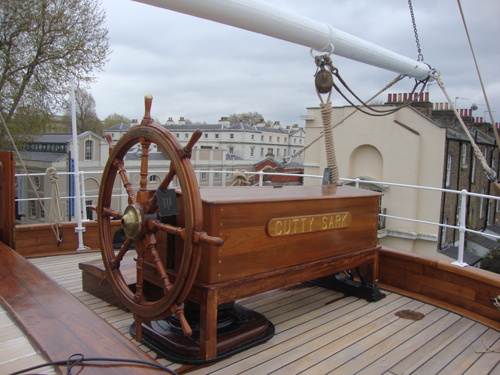 Cutty Sark is open to the public from 26 April. 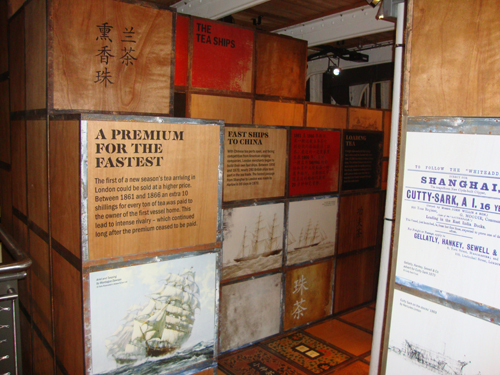 Admission to Cutty Sark is £12 adult, £6.50 children. Family tickets available. More information and booking. 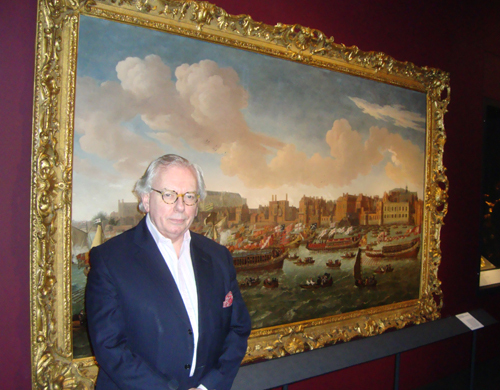 This exhibition at the National Maritime Museum – guest-curated by David Starkey – celebrates five hundred years of the London Thames and its relationship with our monarchs. The narrative sweep is partitioned neatly and chronologically. We see how Tudor and Stuart rulers mounted simply enormous royal processions, mainly for propagandistic purposes. Henry VIII did one for Anne Boleyn. 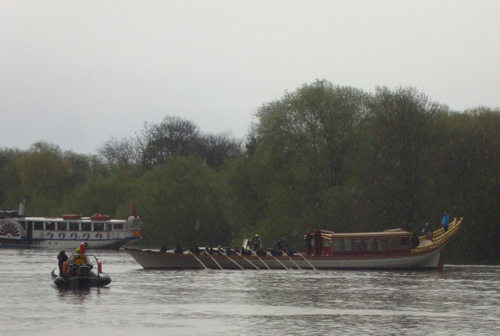 Charles II introduced Catherine of Braganza to the London public with a huge river display for which Pepys himself could not get a berth on any boat for under eight shillings, leaving us to rely on John Evelyn’s account. 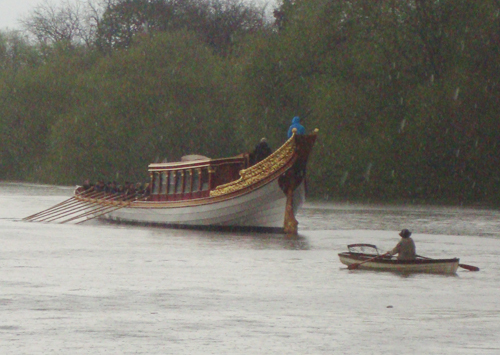 The Queen’s procession on 3rd June will be the first in 350 years to rival these. 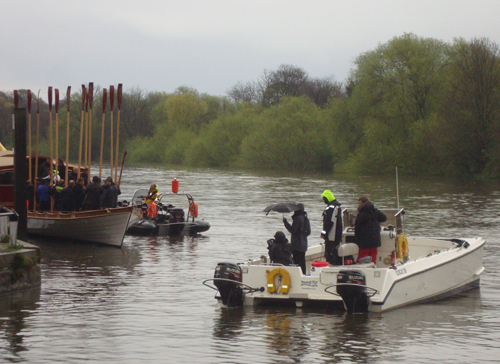 The next section – my favourite – shows us how livery companies, many of whom had their own barges, tried to outdo each other for opulence during the new Lord Mayor’s annual river procession. 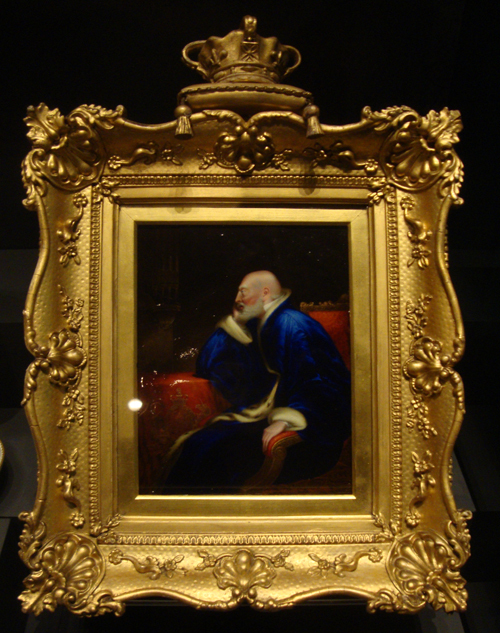 We have contemporary paintings and gorgeous barge objects – carved and gilded coats of arms, patron saints, uniforms and more. Quirky. A 17C mascot statue belonging to the Company of Ironmongers. 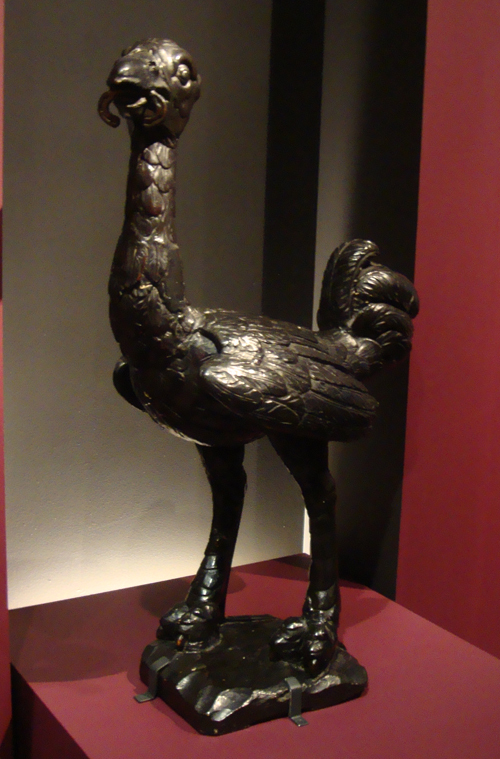 It was believed ostriches ate iron. 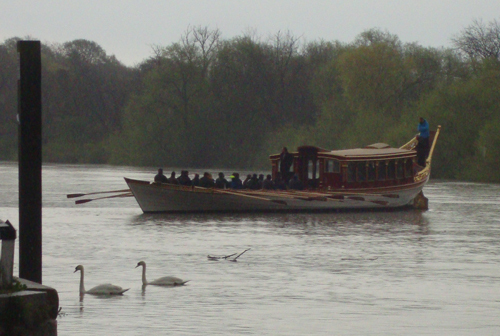 Later on we see how the royal centre of gravity moved west, particularly when George III moved the family to Kew. Objects on show include his telescopes, a microscope and an amazing breakfast table egg boiler (reminding one of Gillray’s cruel cartoon). Poignant. Last known portrait of George III. Wigless, mad and not terribly happy. 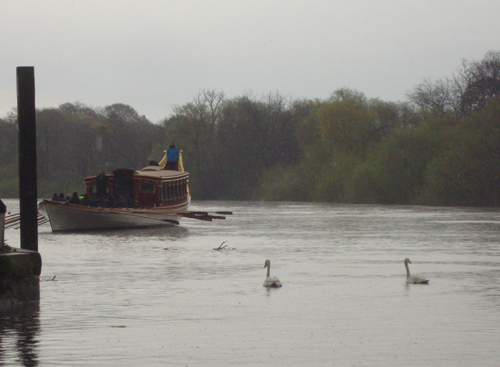 By the early 19th Century, the Thames was sewage-infested and fast deteriorating. The golden age of barge processions as depicted by Canaletto was well and truly over. The exhibition perforce concentrates on new bridges, the embankment and pumping stations. Steam and engineers. 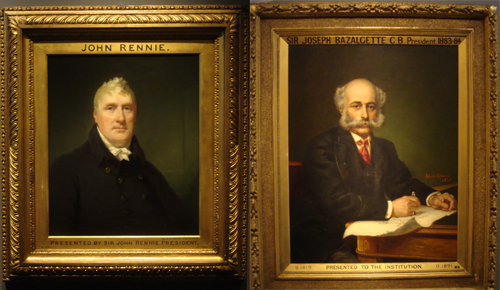 We have portraits I had not seen before of hero engineers: Rennie and Bazalgette. 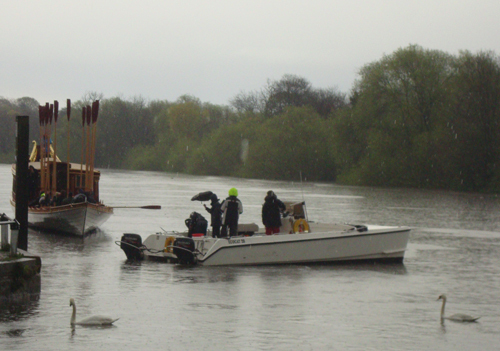 And we have of course Barry and Pugin transforming the Westminster shoreline. 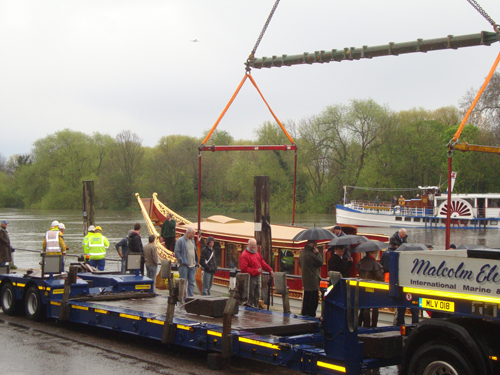 The role of royalty was now opening bridges and pumping stations. 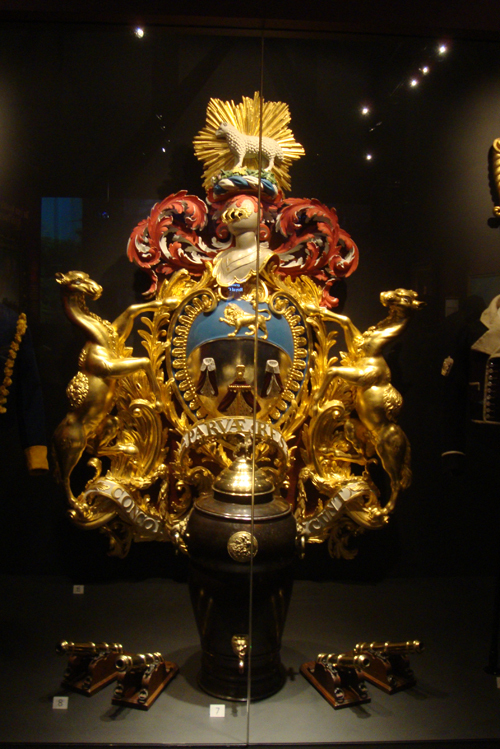 The overwhelming majority of objects brought together for this exhibition have been lent by other institutions; by livery companies; by private collectors; and not least by Her Majesty the Queen. 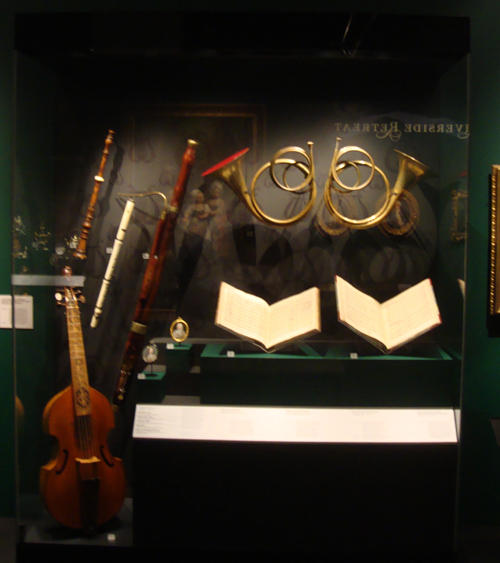 Aside from those mentioned above we have original scores of Handel’s Water Music and Music for the Royal Fireworks; 18C musical instruments; landscape paintings and original architect and engineering drawings; flags, livery and uniforms; royal souvenirs and gifts. My favourite: a huge carved Stuart coat of arms from the ship Royal Charles, captured by the Dutch and still in their possession! 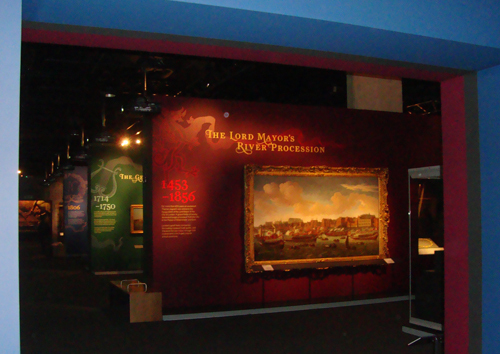 Professor Starkey and the National Maritime Museum are to be congratulated for mounting this stunning and deeply absorbing exhibition. The exhibition runs from 27 April to 9 September. Admission £11. Family tickets available. 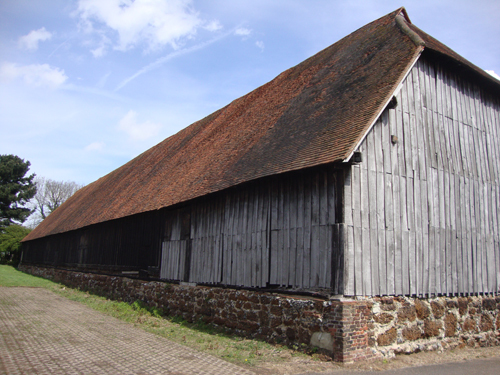 This is what Sir John Betjeman called the Harmondsworth Barn near Heathrow. 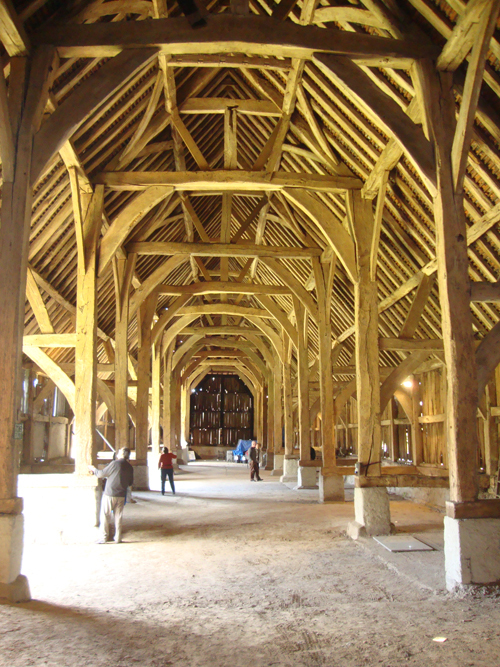 The largest timber-framed structure in England, dating from 1426, this amazing symphony in oak was being used as intended as recently as 1978. Quite remarkable. 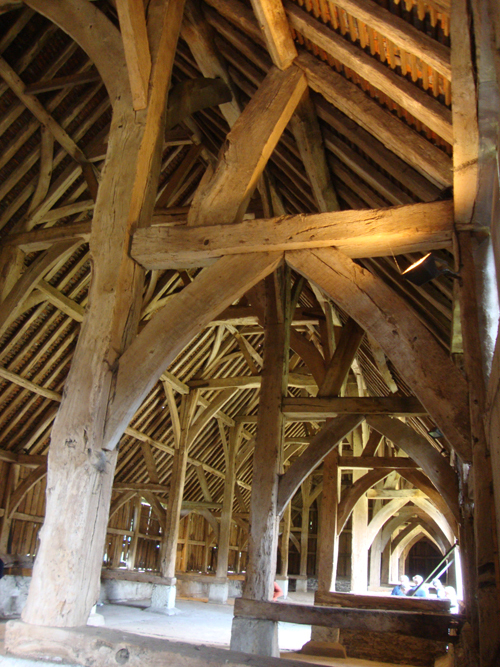 The barn measures 192 feet by 37 feet and is 39 feet high. As you enter, you appreciate immediately what Betjeman meant. When built it was owned by Winchester College, itself endowed some 37 years previously by our old friend, the energetic William of Wykeham (d. 1404), Bishop of Winchester (“manners makyth man”). 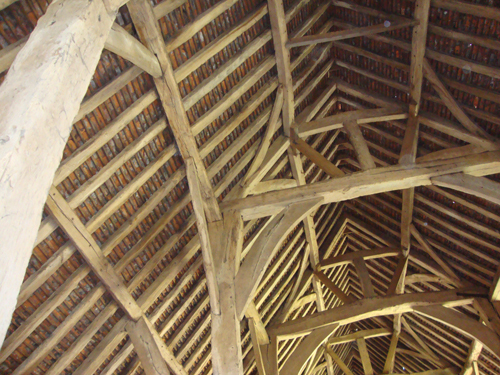 It is believed that the oak almost certainly originates from Kingston upon Thames since records show timber being procured there at the correct date for a barn in Harmondsworth by John atte Oak and William Kypping. 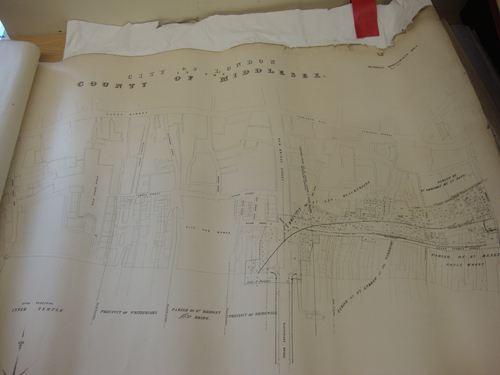 This information is the more tantalising when we consider that Wykeham had holdings in Kingston, including a palace. 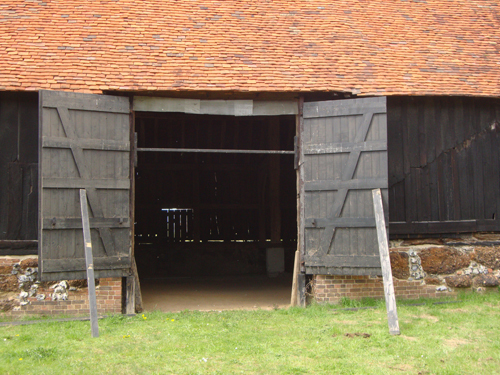 The Grade 1-listed barn was recently rescued by English Heritage and is run by the Friends of the Great Barn at Harmondsworth who have been looking after the building since 2006. 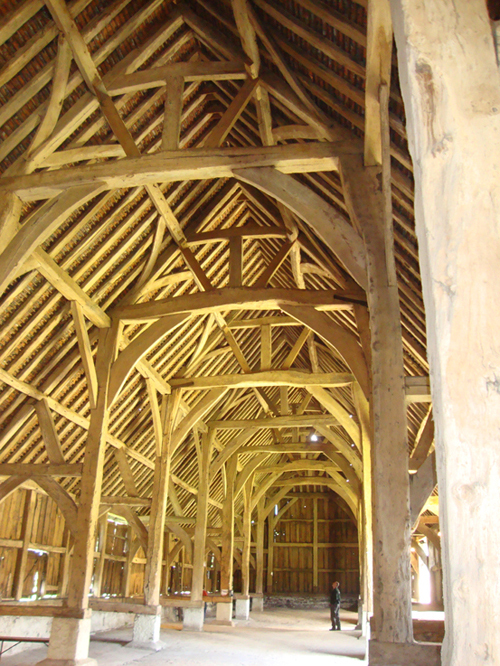 It is open and free to visit throughout this summer on the second and forth Sundays each month 10:00 – 17:00. 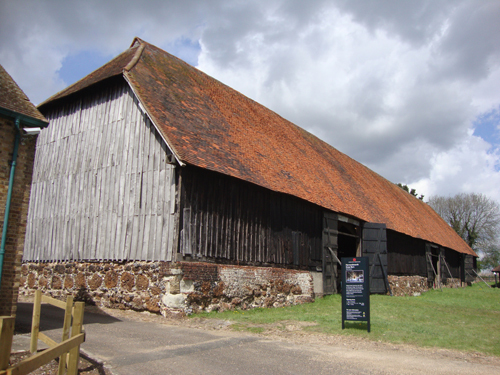 We discovered that Harmondsworth village is particularly rich in ancient buildings. 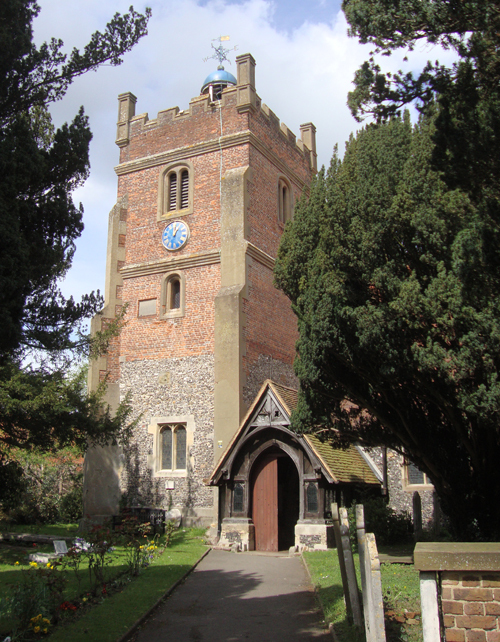 The local medieval church of St Mary’s is lovely. One can easily imagine their harvest festivals for centuries on end featuring produce from the massive barn next door. St Mary's Harmondsworth. 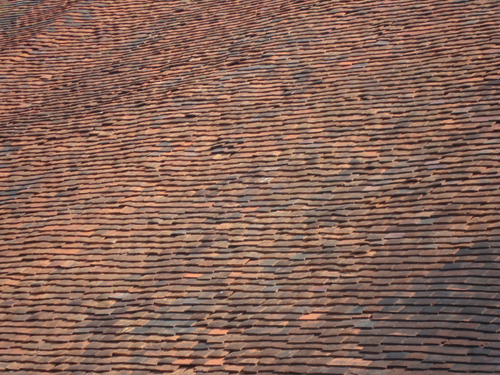 Mostly medieval, with a Georgian cupola embellishment.